Usually when we move into a new house or a new flat, checking the current ventilation system and spending money in a new one are not the first things that we are prone to do, especially if it requires an expensive air exchanger. Concerning the domestic appliance, we’d rather spend our money for the essential equipment and keep what’s left for the decoration. However you should in no case overlook the use of modern ventilation products as they stand for an important device, not only for your comfort but mainly for your health. Most people think that opening their windows every day is enough to renew and purify the air at home. For them the more you open your windows the better your air quality. It is true that opening your windows frequently is really important and it helps eliminating a part of the bad substances in your house. Fresh air kills dust mites and hinders the appearance of moisture. Opening the windows is a very good habit but it is not enough if you want to evacuate all the bad substances in your house. Those harmful particles come from household products that contain chemical compounds, especially the household products that you use to clean your floor or the industrial sprays that you may buy to clean your wooden furniture. Particles produced by painting are also very harmful for your health and it takes a lot of time to be evacuated without the help of a modern ventilation system. But there is another problem that adds a level of complexity when the matter is home ventilation. Sometimes the air that comes from the outside is worse than the air inside your house. This case is rare but it may happen if you live downtown near a large avenue with a lot of traffic. If you live in the countryside the air outside can also be very harmful because you live near cultivated fields. It means that you may breathe a lot of residues of pesticides. And breathing those pesticides is a lot more dangerous than breathing the air on your downtown street even if pesticides sometimes smell nothing! So whether you are located downtown or not, living without a proper ventilation device is not good for your health and for your family. Bad indoor air is responsible for allergies, respiratory troubles, and tiredness and if you live in the countryside it can also foster cancers. 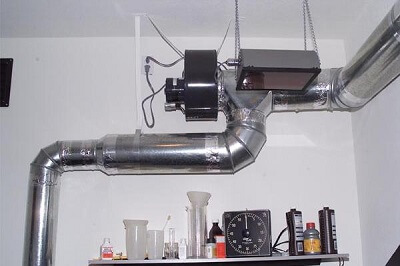 Ventilation devices like air exchangers can help purifying 99% of your indoor air. Air exchangers can seem useless if you often renew the air and open your windows, but like we explained it is not enough to protect your health and eliminate all the bad particles inside your house. The main asset of an air exchanger is that it has a double function: it filters the air that comes from outside and purifies the air inside. With a proper ventilation system you will be sure that your air is good and pure, way more than the air outside, whether you live downtown or not. As we spend 80% of our time inside buildings, ensure good air quality is not option, it is a necessity that every company should follow, but also every family.